The ArbiterSports system is in use for officiating assignments for selected western schools in the Berrien - Cass - St. Joseph Conference (BCS) in the following sports: football, girls and boys basketball, volleyball, wrestling, baseball and softball. While not directly associated with the Fruit Belt Officials Association, some of our members are involved in the assigning process, and almost all of our members officiate regularly in these conferences. Below is some important information concerning the ArbiterSports system. We are confident that the ArbiterSports system is the ideal one for our officials. Not only has it been a leader in the industry for many years, but it was also recently acquired by the NCAA. This ensures increased stability moving forward. If you are a member of either the Fruit Belt Officials Association or the Southwest Michigan Officials Association, your ArbiterSports fees are paid when you pay your dues. Your association will pass on the technology fee on your behalf to the Athletic Assignors Association. Area officials who would like to be considered for assignment to games in the conferences listed above first need to get registered in each sport specific section of the ArbiterSports system. 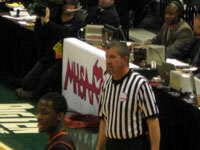 New officials to the system must be invited by each sport assignor. If the new official is an existing user of ArbiterSports, he/she will be invited to join the new group the next time logging in. If a matching email address is not currently in the system, users will get a welcome email from ArbiterSports with log-in instructions. Regardless of how many "groups" an official is a part of, there is a single username and password for ArbiterSports. The username is always the user's email address. The welcome email will contain a temporary password, which must be changed after logging in the first time. The web address is www.arbitersports.com. Users must accept the invitation to be a part of the new group. It is important for each official to check the box that they are "Ready to be Assigned" for each group. If you belong to more than one group, you can log in to the group of your choice after your initial log-in by clicking on the black "head-and-shoulders" icon to the right of the appropriate group. It is highly recommended that our officials take advantage of the new "Sharing" feature, which shares your schedule from any Arbiter assignor with the others. This greatly cuts down on the work you have to do blocking closed dates. Once logged in, click the Profile link at the top of the page. Click the Sharing link underneath on the next screen. Click all the boxes and then click Save. Look at the upper-left section of the screen. All of the groups you belong to will be displayed by number. You can see which group is which by resting your mouse over the number. It will show you the group name in the form of a little "sticky note." Make sure you have clicked in the box beside all groups that you'd like to include in the block. Click "Block All Day" or "Block Part Day" depending on your choice. If you have chosen "Block Part Day" use the time range drop-down boxes to choose the time range you are unavailable to work. On the calendar, click on the date you would like to block. Continue blocking dates for that month until finished. Choose another month by clicking the next or previous month links at the right and left side of the top of the calendar, or by selecting a month from the drop-down list at the right side of the screen. Repeat for the entire season. If you would like to include a note each time you block a date, click the "Add Notes" box at the left side of the screen. This will prompt you to input a short note about that block. This note can be for yourself or for your assignors. If a date that you have blocked later opens up, you can click the "Clear Blocks" option on the left side of the screen and then click the date or dates you would like to unblock. You can also block larger date ranges, using the "Date Range" section at the top right of the screen. Just put in the starting and ending range, and click the boxes for which days of the which to apply the blocks in this range and click Apply. Keep your availability updated throughout the season, not just prior to the initial game assignments. Click on the link for "Schedule." Click either "Accept" or "Decline" for each assignment as appropriate. Click the "Submit" button at the top or bottom of the page when finished. You can view partners, send out reminder emails, etc. by clicking on the game number at the left side of an assignment. The Standard View will show you all assignments from today's date forward for all groups you are in. You can filter the list if desired to show only assignments from a particular assignor by unchecking the boxes for other assignors at the top left of the screen. Although the Standard View gives you the most information on one screen by using a table format, you can also view your schedule by day, week or month by choosing the appropriate option on the left side of the screen. IMPORTANT: WHEN TURNING BACK AN ASSIGNMENT, DO NOT ASSUME YOU ARE OFF OF THE ASSIGNMENT UNTIL YOU NO LONGER SEE IT ON YOUR SCHEDULE. IF NECESSARY, KEEP CONTACTING YOUR ASSIGNOR VIA PHONE OR EMAIL UNTIL THE MATTER IS RESOLVED. To individually accept or reject assignments, click the "Detail ID" button at the far left for the assignment in question. Announcements: important information from your assignor -- listed on the main screen once you log-in to a group. Evaluations: If your assignor has made online evaluations available to you, they will be found by navigating to the Evaluations section of the site. Lists: This section has contact information for officials and athletic directors (use the links for Officials and Contacts). MyReferee: This section has informative information from Referee Magazine (quizzes, articles, etc.). Profile: You can change your email address, password, address and phone information here as well as your Sharing and other preferences. Important note about changing your email address: If your email address changes and you belong to multiple groups, it is important to change it in the system AFTER the initial log-in but BEFORE you have logged in to a group. Since your username is always your email address, this insures it will change for ALL GROUPS.